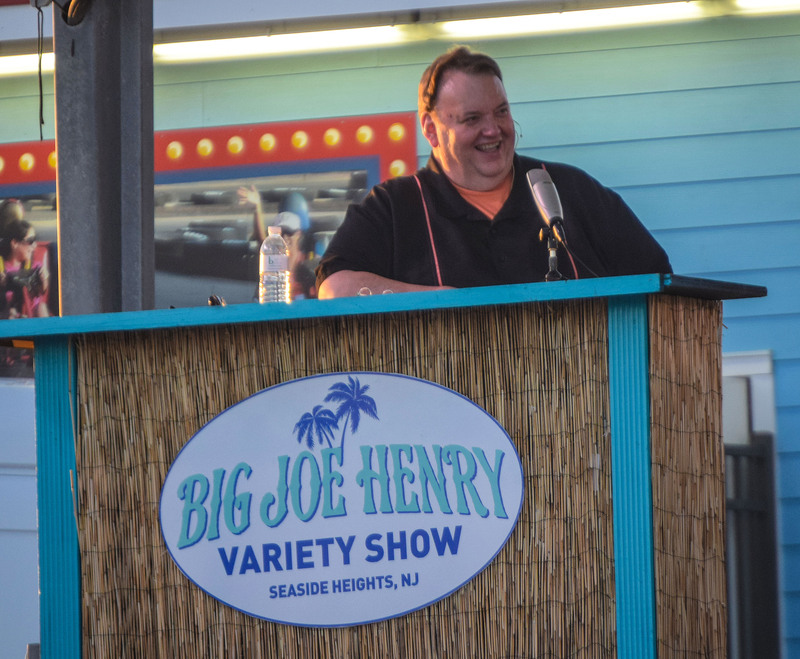 With a voice that booms loud enough to be heard from High Point to Cape May, “Big Joe” Henry is as much a part of the Garden State’s landscape as pork roll and the Parkway. He arrived in Seaside Heights mid-afternoon on Wednesday, ready to set up the second of eight star-studded variety shows planned on the Grant Avenue stage this summer. With the weekly appearances, Henry, a legendary DJ from New Jersey 101.5 radio, is harkening back to his days in Philadelphia television, when he welcomed musicians, comedians and other entertainers on stage. This time around, the show is even better – mainly because it’s at the beach. Having weathered Sandy (literally), the boardwalk fire and less-than-welcome publicity from MTV’s Jersey Shore, Seaside Heights has has been in the midst of a highly publicized rebranding after Anthony Vaz was elected mayor in 2015. The town quickly began cracking down on quality-of-life complaints, is focusing on a redevelopment plan for the Boulevard business district and has added nightly family-friendly events to the boardwalk and beach. It has paid off, Vaz said, in attracting more families and reviving the pleasant atmosphere for which the resort was once known. Henry’s weekly show, held Wednesdays at 7 p.m., started as a few appearances on the boardwalk last year. But true to his nickname, his vision was to make the show much bigger, so this year the production was moved to the main beach stage at Grant Avenue and well-known musicians, comedians, magicians and other acts are set to perform each week. At Wednesday’s show, for example, a musical number segued into a magician levitating a girl picked from the audience to come up on stage. Each show ends with fireworks. Most of the band members are stars in their own right. Several members of Jon Bon Jovi’s Kings of Suburbia make up the seven-piece band, including guitarist Bobby Bandiera, Tommy LaBella on saxophone and Rich Scannella manning the drums. Pat Guadagno is also part of the musical section as well as rockers who have performed with Bruce Springsteen and artists across the world. There’s a little bit of everything, from hula-hoop girls, to jugglers, to Irish step dancers. And the show, once one of those best-kept-secrets, is increasing in popularity each week as word gets out. As good as the show may be, it’s the love of Seaside Heights that brings Henry back every summer with the dedication to do something great that will bring people to the boardwalk. “Every single summer of my life, since I was five years old, I’ve been here,” said Henry, who grew up in the Bronx. Now, with the town seeing the beginning of the resurgence that has been the hope of borough officials for the last decade, Henry says he’s more excited than every to share Seaside Heights with his own family as well as those from across the state. On Wednesday night, attendees piled onto the boardwalk and more set up beach chairs in the sand. Some made a dinner date out of the experience, munching on slices from Three Brothers Pizza while relaxing on the sand. For Henry and his fellow entertainers, the summer shows are more than just a simple performance. There’s also something noble about helping a town overcome so much adversity that it has faced in recent years. Ultimately, Henry says he strongly values his relationship with local officials who have embraced live, family-friendly entertainment on the big stage, each week, all summer. “It’s such a success because of the people here – the [police] chief, Mayor Vaz, everyone,” he said, extolling the beauty of a full day of activities within a quick drive for most New Jerseyans. Editor’s Note: Big Joe Henry’s weekly shows will continue for the next six Wednesdays at 7 p.m. on the Grant Avenue beach stage. The shows are free.